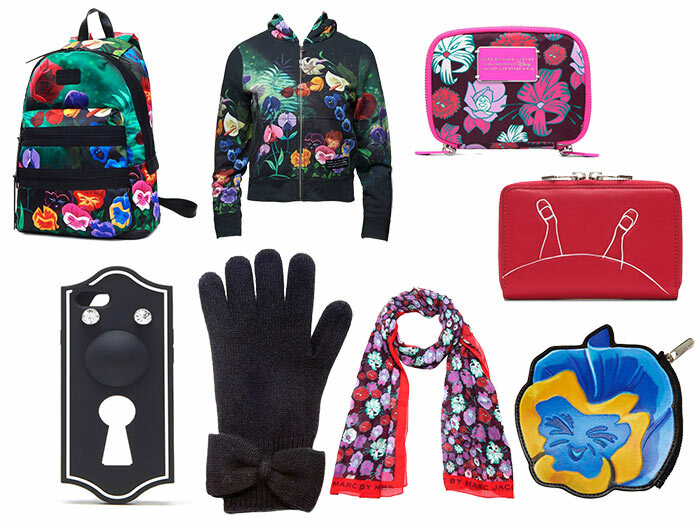 Shop The Marc by Marc Jacobs Alice In Wonderland Capsule Collection! “I’m not crazy. My reality is just different than yours.’ Among the Disney princesses there’s one in particular who has always been the most highly requested muse for fashion designers: Alice in Wonderland. This time it was Marc Jacobs‘ turn to take Alice in hostage, using some images from the 1951 eponymous animated movie and creating a themed capsule collection made of 80 whimsical pieces designed with the help of artist Bob Richards. Jacobs chose his Marc by Marc Jacobs line to release this capsule collection, just a few months before merging it with his mainline. Jacobs has a long history of Disney’s collaboration, as proven for example by his signature Mickey Mouse sweaters and his Marc Jacobs x Damien Hirst limited edition shirt collection, which also proves Jacobs’ inclination to collaborate with the most renowned contemporary artists. Wittily called “I Am Not Like Other Girls”, the fanciful Marc by Marc Jacobs Alice in Wonderland capsule collection is finally available both online (you can purchase the collection on ShopBop) and in stores	and its quite affordable price tags range from $60 to $400. It also features some interesting must-haves, which include a lot of googly eyes. Each piece literally behaves in a totally whimsical fashion, contributing to the collection’s signature look made of both simple and bold lines. Such style juxtaposition is easily to be found particularly with Richards’ pieces, made using a peculiar technologic technique that includes digital sketches of selected 5-second clips from the movie. Some of the best results are to be seen in the Domo Arigato backpacks and in the Garden Flower coin pouch, which managed to combine Jacobs’ and Richards’ unique styles. The ‘I am Not Like Other Girls’ capsule collection features also delicate silhouettes of Alice falling down the rabbit hole, surrealistic silhouettes of the Cashire Cat, as well as images of the iconic Door Knob. Let’s take a closer look at the most standout pieces of the collection, which as a whole includes jewelry pieces, backpacks and pouches, iPhone cases, sweatshirts and knitwear. The t-shirt, hoodie and sweater selection is probably the most representative part of the collection. It alternates colorful pieces, such as the Garden Hoodie ($278), and more plain pieces, such as the Cheshire Cat Tee ($98.00), available both in black and white. From behind the shelves peeks out also the collection’s googly eye pieces, which will in all likelihood be the most sold out pieces of the collection. Jacob’s googly eyes are literally everywhere and one may start to wonder if there’s a deeper meaning behind this choice or not. Besides the above-mentioned Domo Arigato backpack, the collection features some interesting googly-eye-inspired clutches, camera bags and wallets. There are also some practical shopper bags adorned with the same Domo Arigato garden theme that are probably also the most casual looking pieces of the collection. Tech lovers will also appreciate the many Laughing Flower computer cases, available in different sizes and designs patterns. 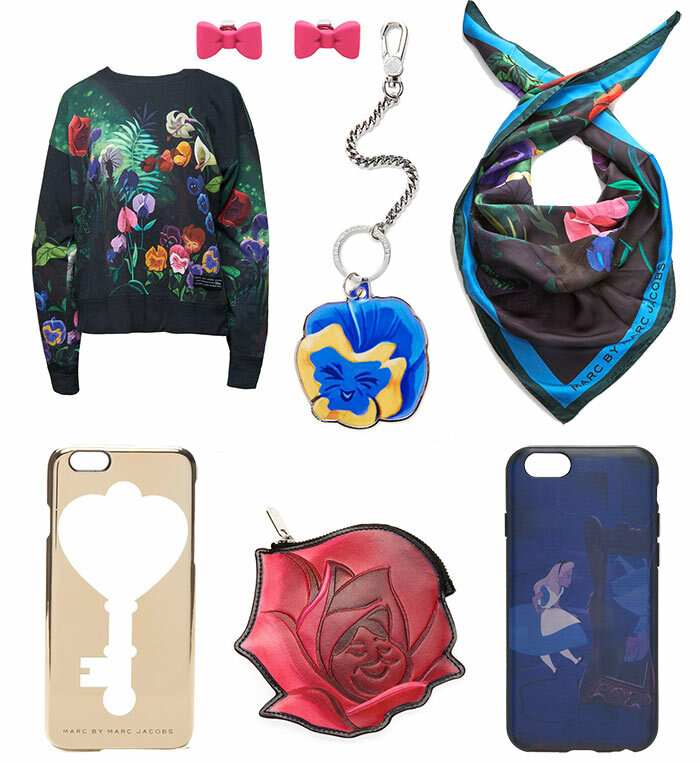 Speaking about technology, Marc Jacobs did not forget to include something those who both love Apple’s smartphones and Alice in Wonderland themed pieces could look forward to: iPhone 6 cases. Each case is filled with Alice’s most iconic moments, from her encounter with the Cashire cat to her contact with the playing cards. Of course, the googly eye design pattern plays a big role even here, making the cases look more surrealistic than any other iPhone case available. Marc by Marc Jacobs’ I Am Not Like Other Girls collection also includes some of the most chosen Christmas presents ever: jewelry and accessories. The accessories give the collection its affordable turn, offering some simple black hats and coin pouches, which take inspiration from the flowers of the Domo Arigato garden. These are probably the more jocose pieces of the collection, and are basically meant for all the devoted Alice in Wonderland fans. The jewelry line includes a This Way Hinge Cuff bracelet ($98), a This Way Double Ring ($68.00) and a pair of Cheshire Cat Studs ($68.00), which all together perfectly manage to give anyone a delicate yet stylish look.